Are you allergic to cats? Learning about cat allergy symptoms can help you answer this question. Here you will find information about the different symptoms, diagnosis and treatment of cat allergies. You will also find tips on how to cope with this condition. Note: If you think you have allergies, you must consult your doctor. The information presented here is not medical advice. It is intended for educational purposes only. Many cat lovers with cat allergies are confronted with a difficult decision: should they give up their cats? The answer depends on the severity of the symptoms. If the symptoms are severe or if they trigger other serious problems, not having a cat or giving up your cat may be the only sensible solution. For example, people with asthma may experience severe asthma attacks if they come in contact with a cat. If the symptoms are mild, however, then there are measures you can take to lessen the symptoms of cat allergies. Many people assume that the cause behind a feline allergy is the cat hair or fur. However, the real cause is a protein called Fel d 1 which is found on the cat’s dander, saliva and urine. Interestingly, particles containing Fel d 1 can spread around rather quickly and it can be found in places where there are no cats. Serious symptoms include: tightness in the chest, shortness of breath and chronic bronchitis (which develop over time). Sometimes these symptoms may appear as soon as the person comes in contact with a cat. Other times, they may flare up hours later. 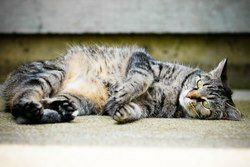 Cat allergy symptoms may be more prominent when petting or grooming a cat, cleaning the litter box, removing hair from furniture, dusting, mopping and/or vacuuming spots where the cat sleeps or lounges. If you have a cat and have allergic reactions, you may think that the cat is the culprit. However, there may be other causes behind your symptoms. For example, you may be allergic to the litter you use. Dust or other allergens carried by your cat can also be the cause behind your allergic reactions. This is especially true if you allow your cat to go outside. Knowing what you are allergic to will help you find the right treatment. So the best way to know for sure is to go to the doctor and get tested for cat allergies. The doctor will do a blood or skin test to diagnose your problem. Since these tests are not one hundred percent right every time, he or she may ask you to live "cat-free" for some period of time to see if your symptoms go away. The symptoms triggered by cat allergies can be treated with anti-allergy drugs, including antihistamines and decongestants. Eye drops and nasal sprays are common remedies. Some of these medications can be bought over the counter while others need prescription from a doctor. Prescription steroids are another common treatment option. You can also get allergy shots, but they are not always effective. Consult your doctor to determine which treatment is best for you. As I said before, sometimes the only solution is not have a cat and/or avoid cats as much as possible. This is especially true if you have very severe symptoms. If you already have one, then you may have to find a new home for your cat. I know, it is heartbreaking but if the symptoms are endangering your health, it may be the only solution. Clean your home often. Cat dander can get everywhere very quickly. Air filters can help you keep your home well ventilated and free of cat dander. If it’s possible, have others help you with your cat’s grooming and the cleaning of the litter box. Bathing you cat with a special cat shampoo can help in reducing dander. If you can’t bathe your cat yourself, you can take him to a pet groomer. Unfortunately, there is not a special cat breed that will never cause allergies. There are, however, a few breeds that cause less allergic reactions than others. 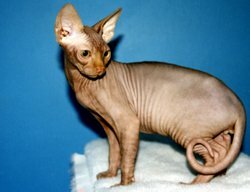 Some of these breeds are the Siberian, the Sphinx and the Cornish Rex. 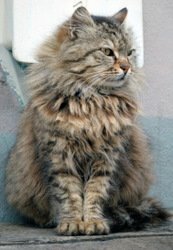 Read more about hypoallergenic cat breeds. Of course, there is always the chance that even a hypoallergenic cat will trigger severe allergic reactions. I hope you find this article about cat allergy symptoms useful. Below you will find additional articles about cats.